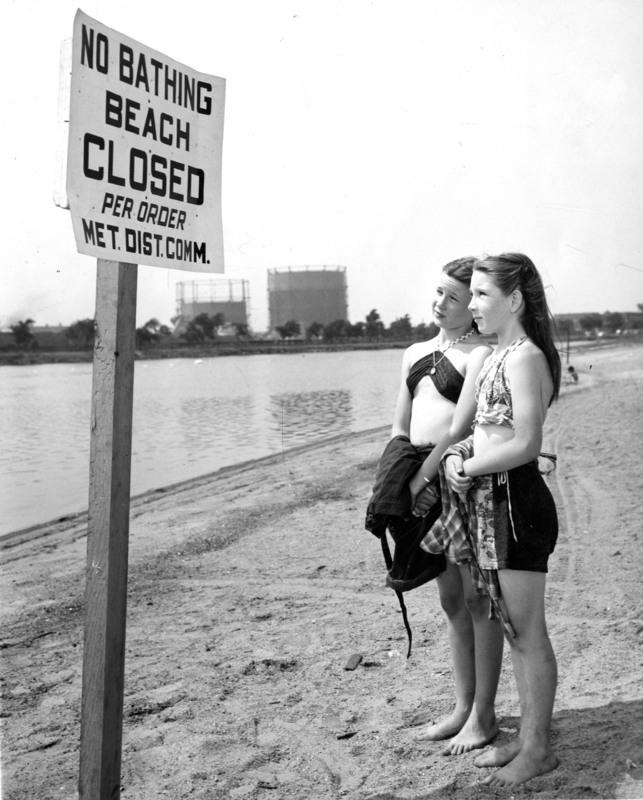 Magazine Beach and all Charles River swimming beaches were closed for good in 1949 due to pollution. The Boston Globe reported that the biggest crowd of disappointed swimmers would be at Magazine Beach, which still attracted 4,000 bathers each summer. Photo courtesy of the Boston Globe Library. On Friday, during the last hours of Magazine Beach—A Place Apart, who should walk into the gallery but Bobbie Halliday, the daughter of Barbara Costa Halliday, pictured on the right above. Bobbie had come hoping to find the photo, taken by a Boston Globe photographer in 1948, for an article about the closing of the Charles River swimming beaches due to sewer overflow. In 1949 all seven of the river’s beaches were closed for good. I have been going there since I can remember. I lived at 28 Elm St. with 9 brothers and sisters and my father (Joseph Costa) would pile us in his station wagon and drive us down there. Once in a while he would take a couple of neighborhood kids if they asked. On the weekends, he would pack us lunches, and if was really hot out, he would take us when he got home from work. The day the picture was taken, a photographer asked if I would pose in front of the picture with another girl I used to play with. That’s how the picture came about. Everyone was so upset. They actually let us swim for that day, but no more after that. When the pools opened [in 1951], they called my father and asked us if we would come down to take another picture for the paper and we did. I guess I went there on and off until I was a young teenager. When I had you kids I would take you almost everyday in the summer (we lived at 101 Magazine St.) and you would play in the kiddie pool until you were old enough to go into the big pool. A lot of my friends had kids too, and we would have cookouts on the weekends in the summer. Thank you Bobbie and Barbara, for sharing your memories and the photos below of the Halliday and Famara families enjoying the park in the late 1960s. That’s Barbara to the left of the nun, her sister Phyliss, in the photo at the bottom. Do you have stories and photographs of the park? Please share them by contacting Cathie at cathzusy@gmail.com. Many thanks to Kit Rawlins of the Cambridge Historical Commission for scanning the photos! ← A Cure for the Winter Blues: Magazine Beach–A Place Apart & Best Ever Chicken!